This namespace is often shortcuted “Scheduler” or “S” in the Microsoft samples. WinJS.Utilities.Scheduler.IJob : everything thing is a job. When you start a task/work using the scheduler, it returns you an IJob object on which you can call management methods. 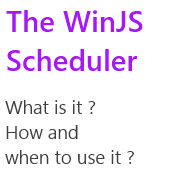 WinJS.Utilities.Scheduler.IJobInfo : information passed to your work-function when executed. WinJS.Utilities.Scheduler.IOwnerToken : you want to be the owner of a task and manage a group of jobs then use this. How to use it (101) ? The returned object is a IJob object and you can call some function on it to cancel it’s scheduling, pause it, resume it and have some information like the name, the priority, the owner, etc. In this case “yielding” means “let other task more important than me start and do their job while I am executing and pause me”. Let’s assume that you have a job which takes 10 seconds to be done and that you can split it in 10 parts. Then you can launch the job with the scheduler, do the first part and tells it : do something else (other jobs with higher priority) if necessary then call me back. The Scheduler will then manage this process for you. setPromise: calling it providing a function tells the scheduler to wait for this promise before to call you back. If you need to download locally an internet resource, the Scheduler does not need to call you before and you can set a promise to wait for the download to be done. setWork : calling it providing a function tells the scheduler which function to call when it wants to continue your processing (after the execution of more importants tasks). shouldYield : read this to know if the function should yield : if true, you set the next function to call using the setWork function and you returns. If false, you do your job. So how do we implement this feature ? By creating a processing function which will process each part in a loop. At each cycle, we will check if we have to yield. If so, we tells the scheduler to call us back when it wants to restart our process. If the process is done (10 parts processed) then we just returns. Here is how I will implement this “10 parts processing”. IOwnerToken is an interface which represents the owner of a job. By owner it means “master” : the one who controls and manage it. A token can be set to multiple jobs at once and there is one function on this interface : cancelAll. This function simply cancel all the jobs owned by the token. To create a token, you have to call the createOwnerToken function. You can then assign it to created job. This token is then really useful when you want to manage a group of jobs at once. Create an owner, if the user do something else, goes to another page : you cancel all the task at once and retrieve some CPU juice. Now let’s discover some useful functions when playing with jobs and the scheduler. retrieveState : you need to dump the schedule queue for debug purpose ? Use this function :). It dumps the name, the id, the priority of the tasks, etc. schedulePromiseXXX : there is a lot of functions with similar names(schedulePromiseAboveNormal, etc.). These functions takes a promise as a parameter. It assures that the completion/error handler is processed on the scheduler with the given priority. If you want a completion handler tob be processed as soon as the promise is done, then use schedulePromiseHigh.